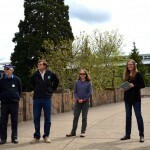 At the 2015 Heritage Tree dedication, speakers included OTE Executive Director Nancy DeSouza, Chair of the Oregon Heritage Tree Committee Roger Brandt, Oregon Garden Club’s Marcia Whitelock, and Paul Ries of OSU’s Urban Forestry. 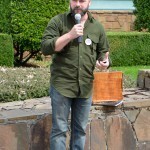 Brian French from Ascending the Giants was the Maynard Drawson Memorial Award’s first recipient. Check in to the gallery by clicking on the first image below. Advance through the gallery by either clicking on the image once inside or using the arrows. Exit the gallery at any time by pressing the “esc” key on your keyboard. 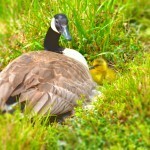 Sitting on a nest might seem odd in the middle of a parking lot strip, but not if you are a wild goose at the ODF&W building in Salem. 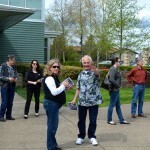 Jenn Smith and OTE former Heritage Tree Administrator Jim Renner wave to the camera before the ceremony. 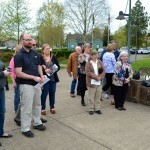 Guests arrive for the 2015 tree awards. 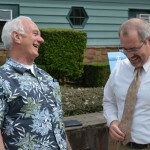 OTE retiree Jim Renner (l) shares a guffaw with Heritage Tree Committee member Paul Ries (r). 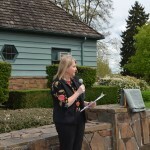 OTE’s Nancy DeSouza welcomes the crowd to the tree ceremony. 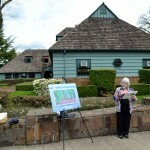 Marcia Whitlock of the Oregon Garden Clubs speaks to the significance of the club’s 1940s efforts to save the myrtlewood trees. 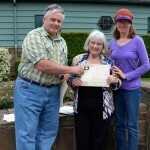 Rodger Brandt and grove nominator Nancy Appling (r) present the award to Marcia Whitelock for the Coquille Myrtle Heritage Grove. 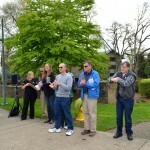 Several members of the committee gather. 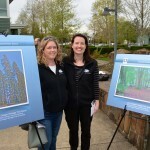 Jenn Smith (l) and OTE’s Heritage Programs Administrator Annie von Domitz stand next to posters of the 2015 award winning trees. 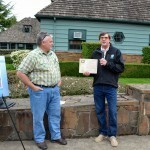 Chair Rodger Brandt and tree committee member Craig Leech present the award for the T.J. Howell Brewer Spruce. 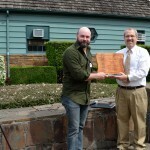 Rodger with the award in front of the Thomas Jefferson Howell Brewer Spruce poster. 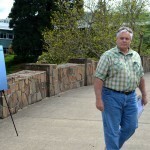 Brian jokes with the crowd after receiving the Memorial Drawson Heritage Tree Award. 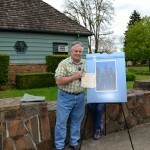 Members of the Oregon Heritage Tree Committee and guests applaud Brian French. 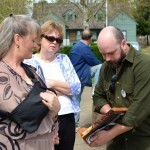 Brian shows his award plaque to family and friends. 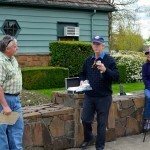 Tree committee member Arne Nyberg presents a gavel crafted from the Barlow Tollgate Maplewood (a heritage tree that was felled by disease) to the OTIC. 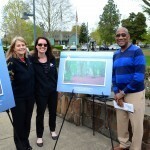 OTE Executive Director Nancy DeSouza (l), OTE’s Annie von Domitz (m), and OTIC member Ed Washington (r) give a smile for the camera. Rodger Brandt heads for the reception following the ceremony.